These cities still seem to provide the most stable and connected environments to gauge and invest in the growth of Asian markets, whilst offering little of the culture shock associated with relocation to less developed nations. However, the success of these cities has also made them less viable for other businesses. With the rising costs of startups and establishing a working base in major centres like Singapore, expat employers and entrepreneurs are searching for the next regional business capital. Decisions based on a combination of local infrastructure and business friendly governance are becoming more pressing as the guarantee of secure and integrated marketplaces meets rising office-space rents and cost of living. 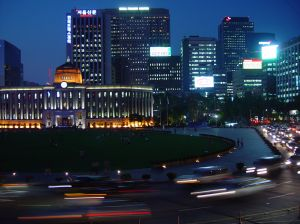 South Korea’s continued excellence in technology and communications has made it an attractive prospect for investment. Coupled with the continual physical investment in business and enterprise zones, and the growing numbers of Koreans with experience of business and study abroad, the outlook for foreign companies is improving all the time. And for employers looking to recruit from overseas, don’t underestimate the appeal to foreign employees of Korea’s culture, and technological status. For many, Korea now occupies the same cultural and interest niche that still makes Japan such an attractive country to a certain type of expat. Regional political tensions are obviously a negative, but South Korea’s ability to grow strongly and smartly despite the long-term nature of these problems should demonstrate the political will to make it a success in spite of this. Countries previously seen only as outsourcing opportunities for cheap manufacturing, like Vietnam for example, are beginning to show signs of focused development across the region. The growth of ASEAN (the Association of Southeast Asian Nations) as a body to represent regional interests, and strengthen ties between countries, has opened up opportunities for enterprise from Indonesia to Laos. With no centralised political programme, as in the EU, ASEAN cannot guarantee improvements itself, so the South East remains a business frontier of sorts, just a less wild than it used to be. The underdeveloped nature of most economies in East Asia should be carefully considered by potential expat recruiters. On the one hand, local expertise will be essential in a country where a language like English is not commonly spoken, and the time costs associated with bringing your team up to a suitable level of local language can be high. But local experts can be invaluable part of your company if they can help your business venture offer a service or product that is specifically tailored to the needs of the market. With the continued dominance of Beijing, Singapore and Hong Kong, it can often seem like the whole of East Asia is going to be overshadowed by the rise of China and the ex-colonial territories. They may have the advantage of developing earlier, but the attention they are drawing will see the continued inflation of costs in these cities, and we should see other more affordable nations gaining, and businesses also benefiting. Living costs for foreign employees in some countries can be tiny compared to historic commercial centres, although local level bureaucracy surrounding property and resident rights can still be problematic without thorough research. Put the time in getting to know your target country’s idiosyncrasies and making some friends on the ground, and you may find that your potential employees can be more motivated by the challenges of growing a business in a country that offers them affordable good living, and attractively exotic culture.